Draft-Nappers, n: A collective designation for people -- both private citizens and government parasites -- who advocate or seek to enforce the practice of child-theft, servitude, and murder called conscription. “The United States military has a very big problem: Too many global conflicts and commitments - and too few soldiers,” began a recent Christian Science Monitor op-ed by academic Edward Bernard Glick. “Yeah, go on,” I said, taking the safety off my Ballester-Molina .45 and putting it on the desk within easy reach. (Oh, I should point out that as I read I was imagining a conversation with the retired Temple University Professor). “That's why it's time to reinstate the draft,” he continued in a less confident voice, his eyes distending and lip beginning to quiver as, my face darkening in visible disgust, I heaved a weary sigh and reached slowly for the handgun. The good professor's reedy voice vaulted an octave in alarm as he tried to continue his pitch. At this point, looking at our three-year-old daughter Katrina (who shows every sign of growing up to be an attractive version of Catherine Zeta-Jones) and our one-year-old daughter Sophia – who, in defiance of genetic expectations, has lissome blond hair, alabaster skin, and cerulean eyes – and imagining them being fed into the maw of the War Machine, I chambered a round and fixed the professor with a dispassionate stare. A dark stain suddenly spreading across the front of his khaki pants, the professor stood up and fled, thus making it necessary for me to read the rest of his pitch in the Monitor. “Well, bully for Israel,” I commented to the professor via cell phone, hearing him gasp and stammer on the other end, shocked and alarmed that I had tracked him down. “• All able-bodied and able-minded 18-year-old men and women should have their names placed in a lottery. Depending on how many soldiers are needed - typically just a few thousand each year - a modest percentage would be drafted. • Then, the names of all those who didn't get drafted should be placed into a lottery for nonmilitary service in city or suburban slums, rural areas, native Americans reservations, or other poverty-stricken places. “I have a better idea,” I said, emerging from the shadows that had enshrouded me, to the professor's visible and audible shock. “Wh-why are you doing this to me?” gibbered the professor as an antipodal stain on the back of his slacks joined the one previously left in the front. Casting the gun aside, I dropped the professor to his feet. “I only use a closed fist when I hit an actual man,” I said, bringing my open palm back to slap him. Recoiling from the anticipated blow, the professor tried to run, then tripped and face-planted into the side of his desk, knocking himself out, just as I had intended. Why hadn't I heard of your blogspot before now??!! Great stuff in true Mogambo style (TMS). Loved it! BTW, military conscription was outlawed by the 13th Amendment, not that it makes any difference to the criminals pretending to be our government. Don't worry so much about conscription, Will. If you're even a moderate richie, simply PAY the piper the required fee, or make sure your Kinder are all enrolled in college after HS (home school) with a sufficient GPA and they are out of the draw. Simple as that, just like it's been in previous mandatory drafts, i.e. Vietnam, Korea, et al. There was a draft exemption fee during the Civil War as well. "Look, can't you see that a draft is not a 'share the misery' arrangement of servicing the war machine as I suspect most of you folk believe and would hope to be the case!!?? The richies simply PAY the pipers in Rome (uh, I mean Washington, sorry) an exorbitant exemption fee and their Kinder are exempt from the draft. Or, if their Kinder are enrolled in a university possessing an acceptable GPA, they're exempt! Get it??!! How else do you think those hippy '60s freaks always had time to protest in the streets of America, live comfortably, and otherwise drink and be merry while your Kinder were slouchin', sloggin', killin', and dyin' in the jungles of Vietnam in misery?? Because, once again, their richie parents paid the piper the exemption fee and/or their hippy kiddies were safely ensconced in a university!!" This is just one of the many reason why I loathe the entire military complex as I said in a previous thread. You worry way too much, Will. Relax! isn't it amazing that under clinton the rant was lessen the military committments, but under bush it's increase the military? mind, i can't stand either of them. it's simply amazing that those who will not fight want to bring back the draft and increase the side of the military instead of getting us out of every country from afghanistan not zimbabwe. america will get what it deserves with a large standing army. today many "support the troops", i wonder if tomorrow they'll say the same when that desert tan boot is pressed agaisnt the side of their face, in their house, in some future time. i think we could cut the army down to 4 divisions and still be able to protect the shores and mainland. could probably get it down to 3 , maybe even two, if the 2nd amendment was actually enjoyed by all americans except govt employees and law enforcement. the draft? i'm like you. though not yet married, if someone came for my kids, or even my ife, to come serve in their war/whatever you wanna call it, i'd have to shoot them. it amazes me how these chumps can speak up for what somebody else's kid should be doing. maybe the solution to the problem is that we register as an endagered species...you know, some sort of animal. being that they seem to have more rights than we do. i wonder if that professor has any kids? probably hates them if he does. good point. won't work in court though. not like we have any laws any more. after all, we have the 13th, yet we still have stop loss. what has happened is that the govt gets you with your SSN. read the back of your selective service card and it basically says, "if you receive a govt benefit, then you must register." the funny thing is is that if you try to get out of social security, they won't let you. don't bother asking them how to do it, they'll lie to you if not straight out tell you that you can't. 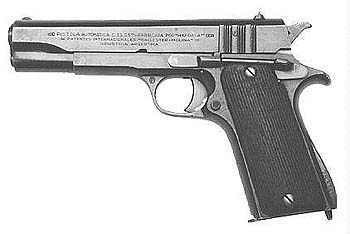 The Ballester-Molina is a fine pistol Will, but I'll stick with my trusty Springfield 1911A1 or my S&W M19 (the finest combat sidearms ever devised, IMOHO). Seriously though, I've never been thrilled with the idea of conscription. If one wants to volunteer for military service, then that is the individual's choice. My problem with conscription lies in that theoretically I, my wife or my children might be forced into a situation where we are required to kill someone without just moral cause (as opposed to government-sanctioned “legal” cause). I agree with the notion that the USA is not the world's police force. The US has been involved in conflicts that we should have not been involved in the first place. If an individual volunteers for military service, I hope that they do so with the understanding that they may be called upon to fight such a war. Conscriptees do not have the luxury of making that choice and being put in such a position involuntarily is untenable as far as I am concerned. Don't get me wrong...I would not hesitate for a second to take up my Mini-14 (I live in the People’s Republic of California where the government feels that non-government entities are either too stupid or criminal-minded to own as AR-15, AK47 or other suitable fighting rifle) in defense of my family and myself. I am willing to take up my rifle in defense of our country if we were invaded, but I reserve the right to take up arms in a foreign land only if the cause is something that I believe to be morally justified. As a conscriptee, I have no choice in the matter. As I said before, this is an untenable position for me morally. Every time I think I'm crazy, that I'm alone in rejecting the national service schemes as senseless power mongering, I read something like this. Also, I personally prefer the XD .45. To each his own. You, Sir William (nod, wink) are my new Hero! Power on! When you say "Don't worry so much about conscription, Will. If you're even a moderate richie, simply PAY the piper the required fee...," what do you mean by "required fee"? During the Vietnam War, common ways to get out of the draft were going to college, getting a medical exemption, and moving to Canada. Just wondering if I'm missing something. Are you suggesting that bribing draft board members, or making "campaign contributions" to elected officials to get one's kids out of the draft were widespread? "The State has no right to force people to kill and die on its behalf, and any government that cannot inspire volunteer efforts in its defense not only deserves to die, it must die." Let us all hope that the "inspiration" that the government uses to effect more volunteers is not another 911, or Pearl Harbor, or some other staged blood sacrifice that I am too uneducated to know about. God help us and be merciful to those who love you. Wouldn't it be ironic if the first African-American president of the USA reinstituted slavery? "You're exceptionally fortunate that I'm a Christian and therefore absolutely will not kill, except in self-defense or defense of my family,"
Huh? Could you please provide New Testament support for this position? How many people did Jesus kill in self-defense (in the example he provided in his life on Earth)? How about Stephen? Peter? Paul? How many Roman soldiers do you think the average Christian "took out" before finally being subdued enough to be fed to the lions? Another German word may (God forbid) enter the English lexicon just as Schadenfreude did a decade ago: Reichstagbrand. Mr. Grigg keep up the good work. I would humbly suggest that you put the reverse-engineered B/M back in the museum case where it belongs. With these, you can feel secure that it will go bang, go bang again, and send the bullet where you aim it with precision. Fine writing, as usual, Mr. Grigg. I suspect many of us have had similar fantasias throughout our lives (personally, I lost count at least a decade ago). "...taking the safety off my Ballester-Molina .45 and putting it on the desk within easy reach..."
This is a Hollywood-ism. No serious student of pistolcraft would move a safety lever to "Fire" and then put the pistol down. "...imagining them being fed into the maw of the War Machine, I chambered a round and fixed the professor with a dispassionate stare..."
Fantastic imagery, but seriously...you brought an unloaded gun to a gunfight? Jeff Cooper would have scolded you mercilessly for this. Again, this is a Hollywood technique, inserted solely for dramatic effect. Alternate suggestion: remove the gun from the holster, ostentatiously chamber-check it, and reholster. "...I continued, pressing the barrel of my gun to his forehead..."
The price paid for this (powerful) image is a grievous tactical error. You do not go into "the hole" on purpose, when you have a precision remote-control weapon at your disposal. A serious pistolero would never do this. He would holster. On safe, of course. "...the gun I hadn't really intended to use..."
By all means, keep up your work. We need it now more than ever.